The 6fusion OpenShift Collector aggregates capacity and consumption metrics for the RedHat OpenShift container application platform. The collector will communicate with the OpenShift API to collect inventory and consumption metrics. 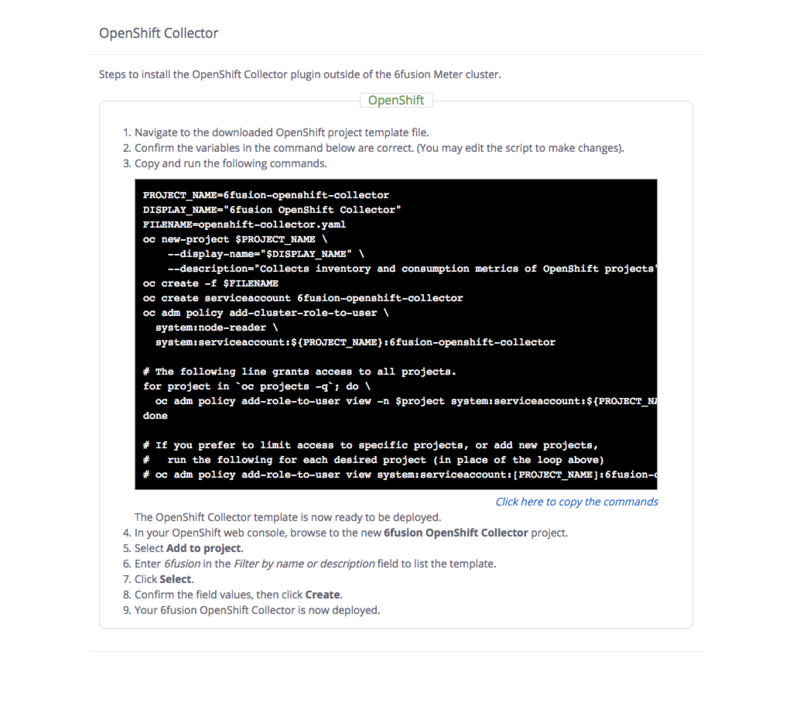 Multiple OpenShift Collectors can be deployed to the same meter. The metrics collected will be sent to the meter for processing and aggregation. The OpenShift Collector requires an OpenShift environment to be deployed into. Currently, the 6fusion Meter only supports deploying plugins into Kubernetes environments. 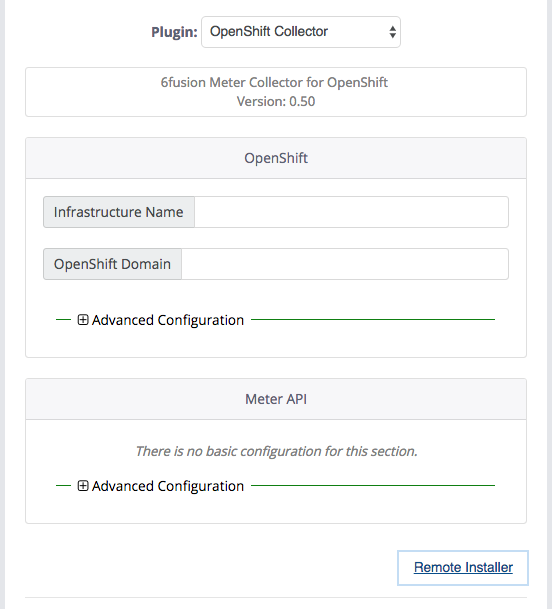 However, the meter dashboard provides an option to facilitate deploying the collector into an OpenShift environment: a Remote Installer option. Follow the instructions in the dialog. A link is provided near the bottom-left of the dialog, to simplify copying the script content. Once you are finished, click outside of the dialog to dismiss it. If your 6fusion Meter is not deployed within your OpenShift cluster, you must ensure the 6fusion Meter API is accessible to your OpenShift environment’s network on port 443. This is necessary for the collector to communicate with the meter. A unique name to be applied to the OpenShift cluster. This will allow you to distinguish between applications deployed to different OpenShift environments. The domain of your OpenShift Dedicated Cluster. For example, if your OpenShift console is accessible at console.6fusion.openshift.com, you would enter 6fusion.openshift.com here. Verify Kubernetes SSL certificate. Do not enable if using self-signed certificates. Age period of data for clean cache. Must be in minutes. A fallback value for LAN I/O speed per node, if the collector cannot determine the actual LAN speed. A fallback value for WAN I/O speed per node, if the collector cannot determine the actual WAN speed. A fallback value for disk I/O speed per node, if the collector cannot determine the actual disk speed. Unique ID of the 6fusion Meter Organization to submit inventory under. OAuth Token for accessing the 6fusion Meter. Leave blank if not enabled. Verify Meter API SSL certifciate. Do not enable if using self-signed certificates.